My last idea was awful so I switched things up. 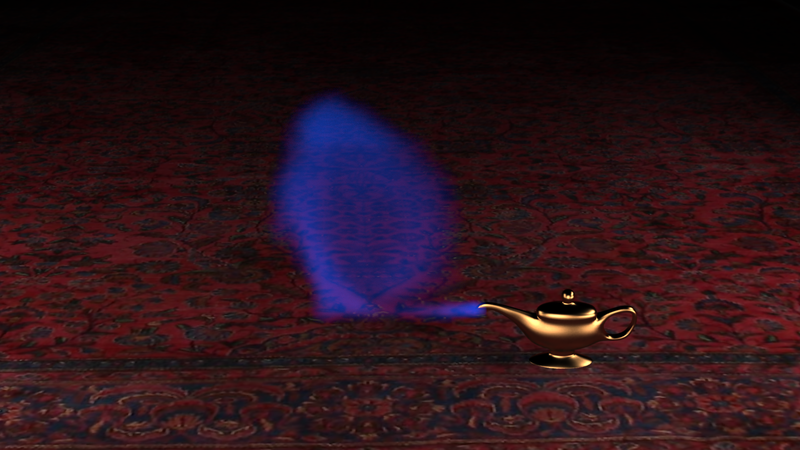 I'm going to make a short animation with this genie lamp to show of my smoke simulator. The scale of the carpet makes the lamp look really tiny, so I have to fix that. The composition also needs to be finalized. One thing that sets this apart from the other phys based scenes is that most of the scene is rendered in Vray instead of Mitsuba. That's because I can light more reliably in Vray. Hard coding lights into scene files for Mitsuba is extremely frustrating, which is why I most often use environment maps. That wasn't going to work for this scene, so I decided to render the scene and smoke separately (the smoke is in Mitsuba), and composite them afterwards.